The parish of Ash today comprises three residential areas; Ash Vale, Ash village and Ash Green. The place name Ash is thought to have originated from “Aesc” which means “at the Ash tree”. The village of Ash was bequeathed in the 11th century to the Benedictine monks at St Peters Abbey at Chertsey. Ash is mentioned in the Doomsday book in 1086 as having a church, 10 villagers and six smallholders. In 1537, following the King’s quarrel with the Pope, Henry VIII’s commissioners closed the Abbey and confiscated its property and assets. The manor of Ash subsequently became the property of St Mary’s College, Winchester. Ash remained a rural farming community until the mid-19th century. In 1854 the army came to Aldershot, and Ash quickly became a popular retirement place for army officers. After a long period when there is no record of the Mass being said at Ash we find the Mass being offered occasionally in the homes of one or two retired officers, probably by priests who had an attachment to the Army during the First World War. The Southwark Catholic Mission who supplied priests to Ash state that there were 140 people at Mass in 1927. The people of Ash are reported as “hiring a hall for mass and a lorry to help those who have no transport”. What a lively and inspiring community it must have been for the Catholics of Ash. In 1931 a building fund was launched at the instigation of Canon O’Farrell of Aldershot. Many people from Ash would go to St Josephs for Mass as well as weddings and baptisms, even though Ash officially came under the care of St Joan’s at Farnham. Father Robo, parish priest of St Joan’s gave the appeal his blessing. Canon Winham, who was one of the priests working on the Southwark mission, took a personal interest in Ash. He had been impressed with the recently built St Catherine’s Church at Wimborne in Dorset, which he believed would be possible within the budget available for Ash. The architect of St Catherine’s, Mr P A Byrne, agreed to design a new church for Ash, although the tower he originally intended for the church was omitted from the design due to financial restrictions at the time. The church was originally dedicated in 1934 as St Michael’s and all Angels, not a surprising dedication given the presence of retired army officers in the parish. St Michael the Archangel is one of the major patron saints of the army. The church is built of stone in the shape of a Latin cross. There are no side aisles. The church was blessed and opened on 2nd December 1934 by Bishop Amigo of Southwark. Over 300 people attended the blessing of the new church, many of whom could not get into the church and had to receive Holy Communion in the church grounds; a choir of students for the priesthood from St John’s Seminary formed to acquire for the first Mass. When the church was built it came under the care of the Archdiocese of Southwark but was transferred to the new dioceses of Arundel and Brighton on 28th May 1965. The church, being free from debt was consecrated on 8th July 1959. It is not known why St Michael was dropped from the title of the church sometime between 1975 and 1980 when the father Timothy Jelf was parish priest. The church underwent a major renovation in 2007 when St Mary’s Hall was built as an extension to the church as a place for social gathering, youth events and to provide a venue for the various projects for the support of the needy in the Third World and the disadvantaged at home. The statue of our Lady, (Mary) in the North transept was made at a convent in France. In the North Transept is a fine copy of a panel from the famous 14th centuryWilton Diptych in memory of Mary Bartlett. The original was made for king Richard II and is now in the National Gallery, Londin. It is particularly significant to the Dedication of this church as it shows our Blessed Lady surrounded by angels as she receives England as her Dowry from Richard II. The mediaeval font was carved in stone in 1898 for St Dunstan’s Church, Woking and rehoused in the church at Ash. The fine modern stained glass window in the west end gable wall by Derek Hunt (2010) is in memory of John Ades, a much loved parishioner and local councillor. There are many more interesting stories and fact is in the archives of the Church of the Holy Angels, Ash. I hope this mini history will give you a hint of the rich heritage we have inherited and an interest in becoming part of the future history of our parish. Catholics do not believe that a statue or painting can contain any of the Spirit of Christ or the Saints; the statues and paintings themselves are made out of wood or stone and therefore are not prayed to or worshiped in any way. As visual aids they act like the pictures on a box of chocolates, they are not the chocolates but give us some idea of what the chocolates might be like. Even today with modern photography we know that a photograph is only a picture and is limited in what it can tell us about a person, but the photograph can ‘open minds’ and can sometimes be worth more than a thousand words in bringing us closer to the person we wish to know. The Statue of Mary the Mother of Jesus This statue came fron France and replaced an older one. Mary was the special choice of God for the Mother of his son, Jesus (Luke 1 v35). She is patron of Christian Mothers and many Christians have a special affection for her. The 14 small sculptures around the Church represent The Way of the Cross Following the Way of the Cross with reflections and prayers has for centuries been a traditional practice in Churches during Lent. Tradition tells us that the practice of making a series of meditations based on the Way of the Cross originated from the Crusaders in the 12th Century. The Crusaders were both soldiers and tourists; when they were not in battle they were keen to see places historically associated with the life and death of Jesus. When they were in Jerusalem they would walk around the city visiting some of the sites associated with Jesus’s journey to Calvary. When the Crusaders returned home it is said that they shared their experiences with their family and friends in their local churches. The Franciscan Friars are said to have seen the devotional and teaching potential in this practice and to have ‘tidied it up’ to resemble the Way of the Cross as we recognise it today. Down through the centuries many others have composed meditations for the Way of the Cross. The themes of this window are Baptism and the Christian Mission to “Go out into the whole world, proclaim the Good News”. The location, in close proximity to the baptismal font at the entrance to the church provides an intimate introduction to the window. The design uses a restricted colour palette complimenting the colour scheme within the church, including autumnal ambers, browns, creams, reds and yellows, with the background being clear glass to allow lots of light in. The main themes of Baptism and Mission are complimented by a number of other themes also running through the window, including references to the life of Mr. John Ades, the surrounding landscape, St. Jude and St. Therese of Lisieux. In more details, the top of the window contains an image of Agnus Dei. This Latin term meaning Lamb of God was originally used to refer to Jesus Christ in his role of the perfect sacrifical offering that atones for the sins of humanity in Christian theology, harkening back to ancient Jewish Temple sacrifices. Directly below is a representation of the Holy Spirit in the form of a dove, referring to the acount in John 1: 32 0 34 of the Holy Spirit descending on Jesus like a dove when he was baptized. The central section of the middle lancet contains a representation of an angel of the Lord with arms outstretched in welcome and outreach. Below the angel the waters of Baptism can be seen flowing down towards the Baptismal font just below the window sill. The left hand lancet contains a representation of St Jude depicted with a flame above his head and an image of Christ held close to his chest. He is the Patron saint of hopeless and lost causes. Below St. Jude is an image of the Shawfield Centre in reference to Mr. John Ades. The right hand lancet contains an image of Saint Therese of Lesieux, the Little Flower of Jesus represented with an armful of roses. She is the Patron Saint of Missionaries and Aviators. Below St. Therese is a depiction of the local canal and bridge, complete with swans. In 1927 Father Dudley of the Southwark Catholic Mission established a Misson at Normandy with five Sunday Masses in the first year. Mass was later said in the village hall and in 1931, land having been given for a church, a wooden structure, which is said to have been an ex world War Canadian Officers Mess, was brought over from Ditchling by tractor and opened as a temporary church in September 1931 by Fr. Francis Bayliss who had been appointed to Ash with ‘responsibility’ for St. Mary’s, Normandy. The two separate Missions fo Normandy and Ash were formally established as one parish in 1934 when the new church at Ash was opened. St. Mary’s, with a small but lively and enthusiastic congregation, continued until the death of Father Jim Martin in December 2001 after which resulted in the redeploymnent of the clergy in the area and twinning of Ash and Heath End in 2002 after which St. Mary’s sadly closed on 31st May 2002. 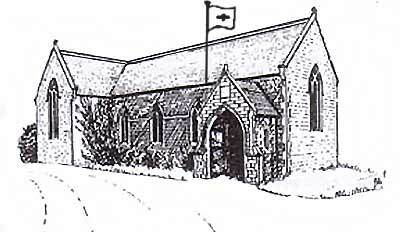 In 2007 the funds raised from the sale of the church site were re-invested in the pastoral care of local parishioners with the building of St. Mary’s Hall at Holy Angels, Ash. There are many more interesting stories and facts in the archives of The Church of The Holy Angels, Ash and St. Mary’s, Normandy. I hope this mini history will give you a hint of the rich Heritage we have inherited and an interest in becoming part of the future history of our parish and local community. HOLY FAMILY CHURCH, HEATH END, FARNHAM. by Father David A. Buckley MA. FRSA. The early history of the Church of the Holy Family is the history St. Joan’s (formerly St. Polycarp’s) Farnham. After the Second World War, Mass was said regularly at Parkside, the home of the Wright family. By the 1950s the numbers attending mass had become too great to be accommodated at Parkside and plans had to be made to build a church. In 1953 Raphael Sergent gave the land in Alma Lane by Deed of Transfer for the building of a church. A simple chapel was opened in March 1954 and this was doubled in size in 1971 to create the church as we see it today when the second half of the church, the steeple and the hall were added. The architects were Batchelor, Stabbings & Partners of Farnham. The incorporation of the original chapel restricted their opportunity for a totally new design. In 1967 the Lady Chapel was added. The carved wooden statue of Mary with the child Jesus has a lead seal in its’ base which tells us that it was carved in Italy . The carver, who is unknown to us, left his mark on the base of the statue, all we have to remember him by now are his initials (DVR) . Mary is depicted unusually offering an apple to Jesus, a symbol of Mary healing the ambition of the Old Testament figure Eve. The attractive Lady Chapel also contains two stained glass windows designed by Moira Forsyth; one of the words of the angel Gabriel to Mary when he conveyed God’s wish that she had been chosen by God to be the mother of Jesus and the other shows Mary responding to the angel’s visit. they are carved in linden wood (the wood traditionally believed to have been used for the cross of Christ) and represent the journey of Jesus to Calvary on Good Friday. They were carved in Italy in the 1950s. Although the church is a very simple structure it is home to some very special works of art . Moira Forsyth (1905 – 1991) a well known artist in stained glass lived in Farnham. Her work is highly praised in many artistic and academic publications which describe her as ‘one of England’s most notable stained glass artists’. She designed stained glass windows for many famous locations including Guildford Cathedral and Norwich Cathedral. Several experts say that her finest work was achieved for the little church of the Holy Family at Heath End where she worshiped when she lived in Farnham. Moira designed fourteen stained glass windows for the Holy Family church, perhaps her greatest achievement in stained glass is the large Epiphany window behind the altar of Our Lady with the child Jesus (height 144 ins x width 89 ins) and the Last Supper Window. On the south side of the church (the side which faces Alma Lane) there is a small chapel dedicated to St. Joseph, the foster father of Jesus (Matt: 1 v 18-24). St Joseph is also the patron of Christian fathers. The delicately carved wooden statue reminds us that St. Joseph worked with wood as a carpenter. The Church is very lucky to have these important artistic gems; perhaps the simple architecture of the church is the most suitable setting for such impressive and beautiful works of art. Moira Forsyth (1905 – 1991) is one of the best known British stained glass artist of the 20th Century. Her work can be found in Cathedrals and Catholic and Anglican Churches. Moira was born in 1905 into a family that was recognised locally for the diversity of its artistic talent. Moira’s father, Gordon Forsyth, was an accomplished artist in both ceramics and stained glass and principle of Burslem Potteries School of Art. He was a man whose religious faith and strong socialist principles guided his life and inspired his work. In the 1920s , through the recommendation of the local MP Andrew MacLaren, he gained a commission to work on St. Joseph’s Church at Burslem which gave him, and later his daughter Moira, the opportunity to develop their interest and talent in religious art. Moira’s talents gained wider recognition both in the UK and internationally when she exhibited at the 1925 White City Exposition. Shortly after the Exposition Moira won a National Scholarship to the Royal College of Art, following which she worked for many years at the ‘Glass House’ in Fulham and also with Lowndes and Drury. Moira’s many stained glass windows show her to be versatile in her subject matter including not only pictorial representations but also symbolic, script and heraldic illustrations. Moira received the Queen’s award for lifelong services to the arts. St. Joseph’s, Burslem. Norwich Cathedral. Guildford Cathedral. Emmanuel School, Batersea St. Margaret’s, Tatterford.. Aylesford Priory. St Botolph’s, Chevening. All Saints, Snodland. St. John’s, Higham. Holy Family Church, Heath End, Farnham, Surrey. Holy Family Church is a simple 1950s village size church which would have been of no special artistic merit had Moira Forsyth not lived locally and worshiped at the church. It now houses 20th Century stained glass of national importance. Over a period of sixteen years Moira designed and made fourteen windows for the church, amongst which is her great Epiphany window and the Last Supper window. This collection of her stained glass at Farnham is the largest and most comprehensive collection of her work in glass. Porch: Style – Pictorial. Subject: The Holy Family. Date:1968. Height: 69 ins. Width: 39ins. St Joseph’s Chapel: Painted and fired Glass. Style: Script. Subject: A Prayer for a peaceful end. Date: None. Height: 63 ins. Width: 20 ins. from the Easter Exultet. Date: 1971. Height: 63ins Width: 20 in. Sacristy: Style: Symbolic. Subject: The Eucharist. Date: 1976. Height: 43ins Width: 19 ins. Sacristy: Style: Symbolic. Subject: Genesis-Creation. Date:1976. Height: 43 ins. Width: 19 ins. Church: East Wall-Right. Style: pictorial. Subject: The Resurrection. Date: 1971. Height: 69 ins. Width: 39 ins. Date: 1960. Height: 144 ins. Width: 89 ins. Church: East Wall–Left. Style: Pictorial. Subject: Baptism of Jesus. Date:1969. Height: 69 ins. Width: 39 ins. Reconciliation chapel. Style: Symbolic. Subject: Ez. : 36: 25.26 ‘ I will cleanse you in living water’. Date: 1971. Height: 63 ins. Width: 20 ins. Lady Chapel: Style: pictorial. Subject: The Annunciation. Date: 1974. Height 69 ins. Width: 39 ins. Lady Chapel: Style: Script. Subject: Ave Maria -Hail Mary- in Latin. Date: 1974. Height: 69 ins. Width: 39 ins. House Chapel: Style: Pictorial. Subject: The Last Supper. Date:None. Height: 40 ins. Width: 85ins. Father David A. BuckleyMA. FRSA.